DIY Organic Greek Yogurt, Baby Safe! Who knew making your own organic yogurt was such a cinch and required so few ingredients!! Yep, this is all you need. Well this and a few cooking utensils. Granted this only makes plain yogurt, but once youve made the yogurt, the toppings/mix in possibilities are endless. The yogurt maker is an FAO model and I bought it for $8 at Babies R Us. 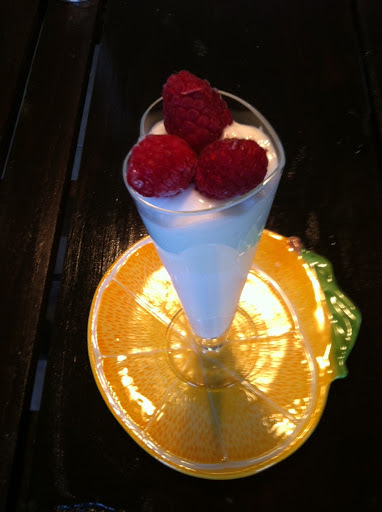 I have also made yogurt without it, but it is easier and comes out thicker with the yogurt maker. 2+3/4 cup organic whole milk. Try not to use the ultra pasteurized kind. Whisk dry mill into milk in saucepan over medium heat. Heat mixture to just below boiling, stirring often. You’ll know because it will start to make noise and bubble. Remove mixture from heat and let cool until lukewarm. Stir occasionally to allow uniform cooling. Meanwhile, whisk Greek yogurt in a separate bowl until smooth. When mill mixture is lukewarm, pour it into the yogurt, stirring very gently to incorporate, but do not whip. Place resulting mixture into glass jars and place in yogurt maker with no lid for 8-15 hours. The longer it sits, the thicker and tangier it gets. Note, once you have made your yogurt, you may use that as your starter for the next batch! How cool is that. You can perpetuate and sustain your own yogurt making. You have to use it within 5 days however, otherwise there aren’t enough live active cultures to make the yogurt. You can also make the yogurt without the yogurt maker by putting it in your own jars and setting it in a pot full of really warm/hot water for 8-15 hours. That requires a bit more diligence and monitoring of the water temperature, but it worked for me!! Once yogurt is done, let it set in the refrigerator for at least an hour. Then enjoy with fruit or any other mix in! I feed it to my son plain and he really likes it! I added fruit to this picture in the spirit of valentines day :). I couldn’t resist.